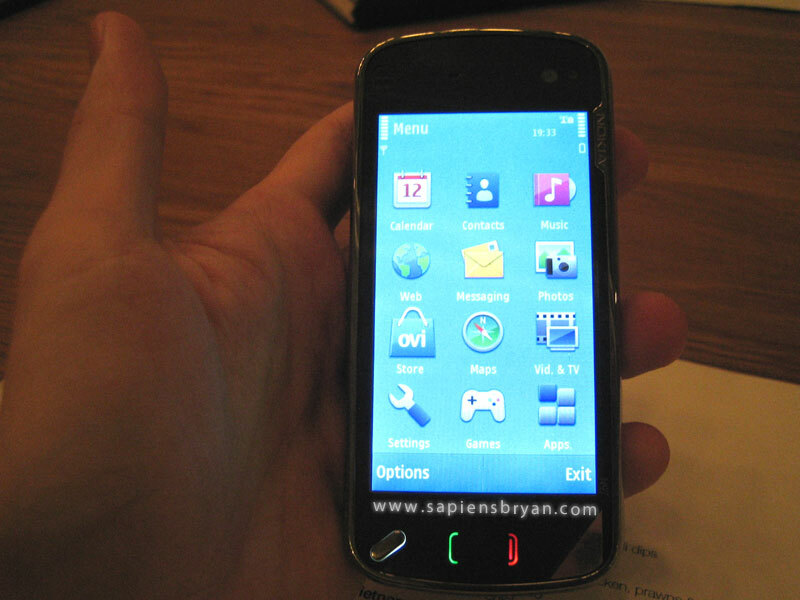 Nokia N97 Sneak Preview – Part 2 (Software)! 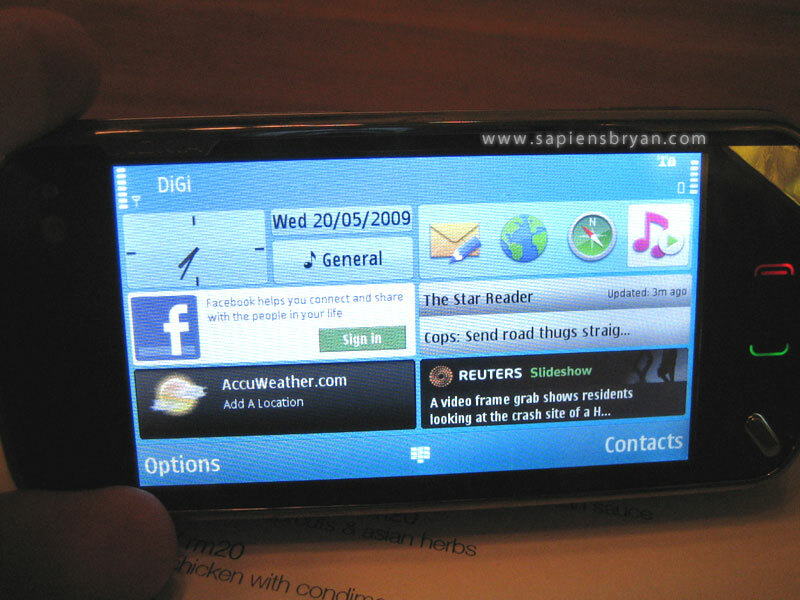 Here comes the part 2 of Nokia N97 sneak preview, it’s all about the software the phone uses. You will be able to add up to 6 favourite widgets on the main screen and you can even arrange them according to your preference (see screen shot below). All widgets will load automatically if you have an active data plan or you are hocked up with a wireless (WiFi) network. 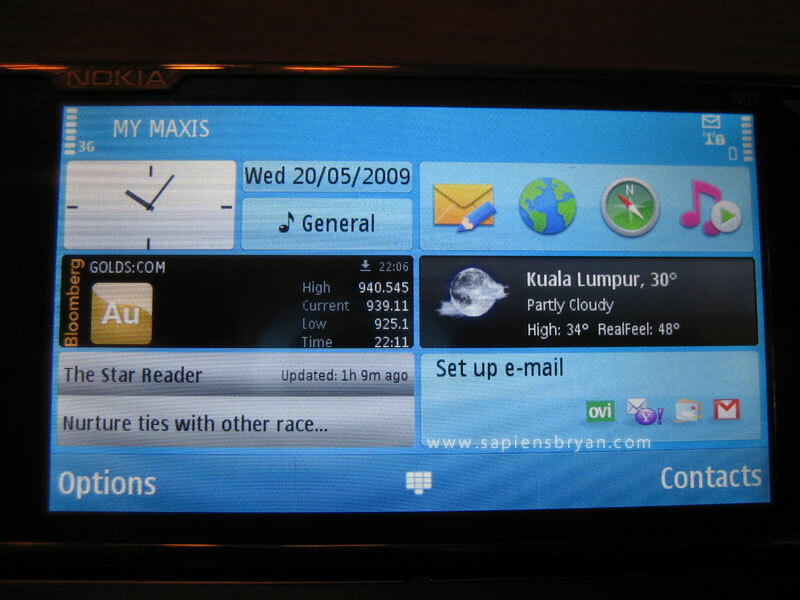 Some of the applications in N97 are specially developed with the collaborations between Nokia and 3rd parties such as Facebook, Bloomberg, Reuters, etc. How thoughtful that is! 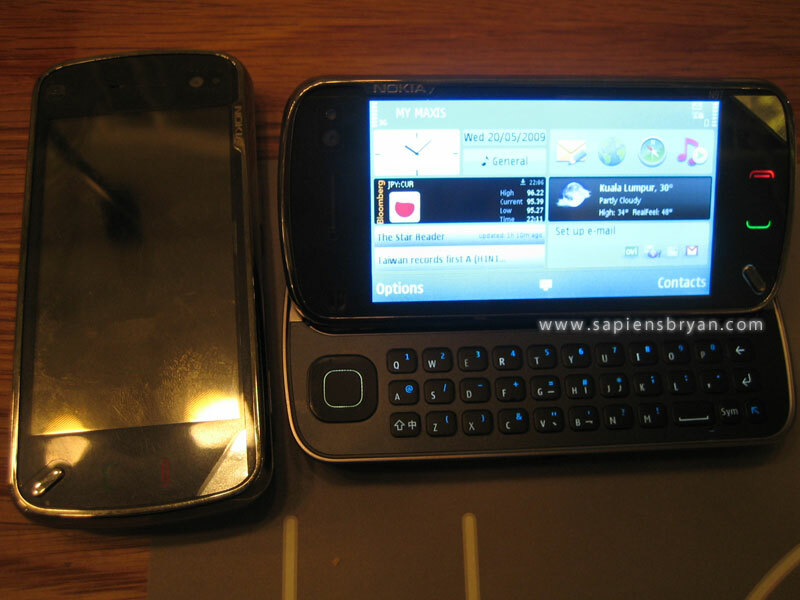 Nokia N97 Sneak Preview – Part 1 (Photos)! I was invited to attend the sneak preview of, the real iPhone Killer (at least I think so), Nokia N97 in Kuala Lumpur (KL) last week. It was my pleasure to meet up with the people from Nokia, David and Erna. Special thanks to David for getting in touch with me and given the chance for me to have first hand experience with this long-awaited mobile phone. The size of the phone is unexpectedly smaller than I thought and it’s lighter that I thought too. I don’t have a big palm and the phone definitely doesn’t look bulky at all when I’m holding it. iPhone Hits Malaysia, A Little Too Late & Why It Would Fail. Just received an SMS yesterday evening from my mobile service provider, Maxis, informing the launch of the official iPhone 3G in Malaysia. Well, after about 2 years since its first launch in the US, the long-awaited iPhone has finally hit Malaysia… a little too late. 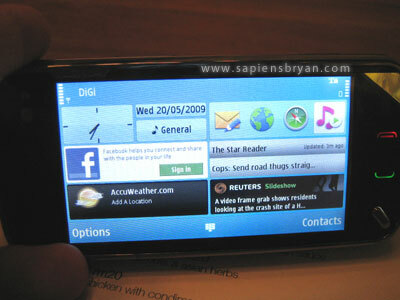 Last December, I wrote a post about the failure iPhone 3G suffered during its launch in India. Frankly, I would expect the same will happen in Malaysia. 1. The hype of iPhone is certainly over. What iPhone? It’s all about recession right now! 2. Many iPhone killer (mostly touchscreen mobile phones) are freely available with no string (the stupid subscription plan) attached. 3. One of iPhone rivals, Nokia XpressMusic 5800, is selling at less than half of the iPhone 3G’s price. 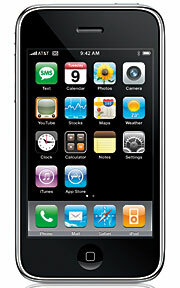 Would you pay around RM3,000 for an iPhone 3G, while you can get a XpressMusic 5800 for only RM1,400? 4. Too costly, for a mobile phone with only 2MP camera, no MMS, lack of Bluetooth support, no Flash support, no cut&paste function, etc. 5. No unlimited data plan. The maximum data usage included is 3GB and you have no other choice to make it unlimited using their subscription plan. 7. You can get unlocked smuggled iPhone 3G easily, at a much lower price. This is Malaysia, you know! You may then top it up with an unlimited data package for only RM120 RM99/month from the same provider (Maxis). LoL! 8. The real iPhone killer is launching soon! The price is about the same too. I understand iPhone fans may not agree to any (if not all) of the reasons above. Anyway, tell me what do you think. It seems that not everyone is anticipating the launch of iPhone in their country. Well, at least not in India. The launch in Hong Kong and Singapore was fascinating and quite successful. I was there in Hong Kong when the iPhone was first launched, long queues and big crowds were easily to be seen outside the selected mobile phone outlets. So does what happened in Singapore, but unfortunately not in India. It is reported there were only around 12,000 units sold since its first day launching in India, which is less than a quarter of the imported 50,000 iPhones for sale in India. Is this the effect of the economy slowdown? Or disappointing marketing campaign? Or just merely difference in taste? Outlets failed to obtain necessary permissions to stay open in midnight for the midnight sale. Apple initially announced that iPhone would be selling for about US$199 globally and this news gave potential customers false hope because Apple is now selling 8Gig version for US$700, while 16Gig version for US$825 in India. I suppose iPhone will be launched in Malaysia next year, which is a year troubled by bad economy. Do you think we’ll see pathetic sale here as well? Some other users complained that British accents are not recognized correctly too. Well, personally I think that’s kinda predictable because even handwriting recognition is still improving its technology after so many years since the first generation of Palm PDA was released. Note that voice search will be enabled by default for U.S. English users only. Anyway, I think we can count on Google Mobile to improve its voice recognition and support more languages in the future as well. 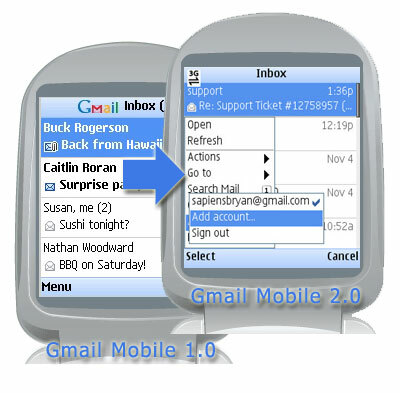 GMail Mobile 2.0 was released on 23rd Oct and I upgraded it immediately. The newer version is still very small in size (256kb), but now supports more J2ME phones (Nokia N95, BlackBerry, etc.) with over 35 languages for users to select. Well, it’s undeniable more useful features have been added into v2.0, but I still experience slow connection (even on 3G) every now and then. Need refreshing (to load new emails) after logging in. Loss of connection even signal is good. I suppose GMail has become the top pick for free email service nowadays, so if you are using it GMail Mobile 2.0 is the application you must have on your mobile phone especially you are always on the move.